For many of us, our smartphones carry our whole world—contacts, messages, payment information, eclectic music collection—so it’s hard to understate the importance of keeping everything safe and secure. Certain apps can make a big difference—protecting your data and securing your communications. Here are six well worth installing. In these password-heavy times, having an app to manage all your login details for you can make a significant difference to your productivity and security. Enter LastPass, which can safely store passwords, shopping profiles, sensitive personal data, and more besides. All you need to remember is one LastPass password, and if you’re stuck for new combinations for new sites, there’s even a password generator included for you. Besides working on Android and iOS, LastPass also works for on Windows, MacOS, and Linux, so you can secure your passwords across all your devices. A paid-for premium plan is available if you need to share the LastPass service with other members of your family. 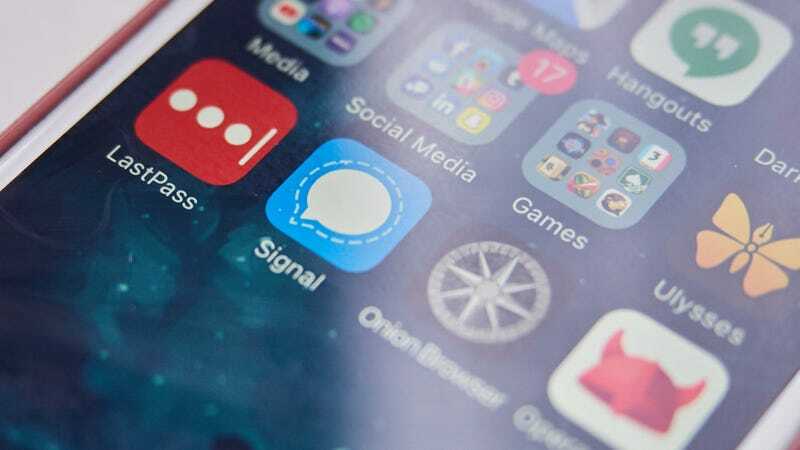 Our favorite app as far as encrypted messaging goes, Signal takes security more seriously than some of its better-known rivals, plus brings to the table all the essential IM features you’re going to need: group chats, VoIP phone calls, read receipts and much more besides. Crucially there’s also end-to-end encryption—which means the only people that can read your missives are the person recieving them. So would-be snoopers can’t take a look at your chats, even employees of Signal itself. Plus, it’s also lightweight and easy to use, though it only works with other Signal users. So you will have to convince your friends to go out and get it too. You have your reasons for browsing the websites you browse, and maybe you’d like to keep those reasons, and your browsing activities to yourself. Orbot brings the power of anonymous browsing and messaging to your Android device, tapping into the open source Tor network to make sure the 1s and 0s you’re sending and receiving are encrypted, anonymized and bounced around various locations worldwide. Orbot sits underneath your other apps, like Facebook or the phone’s browser, and anonymizes the data being transmitted. You can configure Tor access on an app-by-app basis if there are some apps you’re more paranoid about than others—useful when you value speedy browsing over secure browsing. Despite some of the advanced privacy features at work under the hood, Orbot itself is straightforward and relatively easy to use. Apple fans aren’t bereft of Tor browsing options either. For those of you on iPads and iPhones, one of the best (and longest-lasting) Tor-powered options is the Onion Browser. What it lacks in the aesthetics of its design it makes up for in the extra layers of security it offers versus the built in iOS browser, and it’s recently been made free on the App Store too. As with Orbot (above), the Onion Browser keeps your browsing encrypted, anonymous, and very difficult to track, though in this case the connection is limited to this browser rather than being applied system-wide. A version with a revamped look is in the works too—so eventually you’ll be able to browse anonymously on an iPhone without looking at such an ugly browser user interface. If you want to secure more than just the browser and specific apps on your phone then you’ll need a VPN (Virtual Private Network). VPNs secure all the data coming in and out of your device (at the cost of slowing down data transmission). That keeps people from snooping or breaking in. VPNs are especially useful if you’re on a public network where the security might be less than ideal—like at your local coffee house. Some mobile VPN apps are unreliable and difficult to work, but not Opera VPN, which also happens to be free to use. The app not only helps keep you safe online, it can block ad trackers (and report on their actions) and allows you to spoof your location too. Android can have a nasty habit of creating lots of useless files that eat up precious space on your phone’s storage. CCleaner, one of our favorite computer cleaning applications is now available for Android devices, so you’ve got no excuse for having junk data and unused apps hanging around on your phone. Upgrade to a premium account to get the option to schedule cleanups in advance. In terms of staying safe and protected on your phone, CCleaner’s main benefit is going to be tidying up cached files, browsing histories, and downloaded files that you might not want other people peeking at. Now you can finally permanently remove that one really embarrassing photo on your phone.